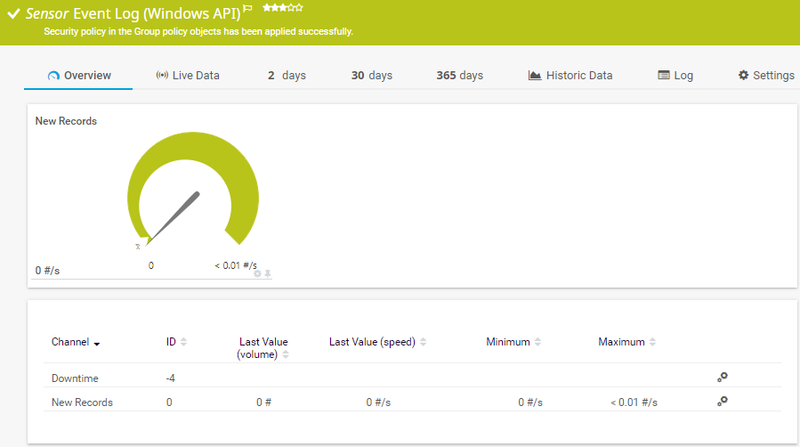 The Event Log (Windows API) sensor monitors Event Log entries using Windows Application Programming Interface (API). This field is only visible if you enable source filtering above. Enter a source from which the events come from. Only events from a source matching this string are regarded, other events are ignored. Please enter a string. This field is only visible if you enable ID filtering above. Enter an event ID which the events must have. Only events with an ID that matches this value are regarded. Note: The Event Log (Windows API) Sensor supports more than one event ID. Using this sensor type, you can enter a comma separated list of event IDs to filter for more than one ID. Note: The WMI Event Log Sensor supports filtering for only one ID. This field is only visible if you enable category filtering above. Enter a category which the events must have. Only events with a category that matches this string are regarded. Please enter a string. This field is only visible if you enable user filtering above. Enter a username that the events must to be assigned to. Only events with a username that matches this string are regarded. Please enter a string. This field is only visible if you enable computer filtering above. Enter a computer name which the events must be assigned to. Only events with a computer name that matches this string are regarded. Please enter a string. This field is only visible if you enable message filtering above. Enter a message that the event must contain. Only events with a message matching this string are regarded. Please enter a string. Note: The Event Log (Windows API) Sensor always performs a substring match. Please do not use any placeholder character. For example, enter RAS for any event source containing this string in partial or whole form.